J. pyrrholoma specimen, Smithsonian Institute. Physical description: About 14 to 18 mm in length; largest species of the genus Jadera. 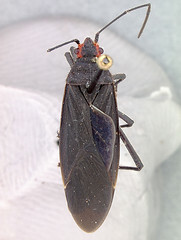 Dark brownish black dorsal side; area around eyes are red or yellow and sides of pronotum are dark red. Center line of pronotum is well defined. Ventral side is mostly brown or black; costal margins are red. Appendages are dark brown or black.